Discussion in 'Apple iPad News' started by iDan, Oct 14, 2010. Apple continues to expand the iPad making it available in more retail stores and today announces it will be available through Verizon Wireless October 28th. 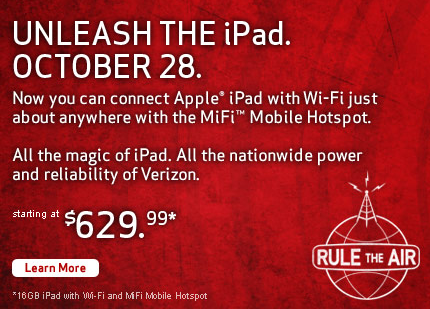 Three bundles will be offered combining the iPad Wi-Fi model with a VZW's MiFi mobile hotspot. The iPad 16GB + MiFi bundle will sell for $629.99, the iPad 32GB + Mifi bundle will sell for $729.99, and the iPad 64GB and MiFi bundle will sell for $829.99. The data plan will be a monthly fee of $20.00 a month for up to 1GB of data. Any thoughts that Apple and VWZ just might be working on an iPad 4G (LTE) version launching next year as the iPad 2? Most definitely. I'd say the likelyhood is 75%. How's that? They seem to be charging the exact same amount for a wifi iPad with mifi base as the 3G iPad. Service is more expensive, but it is better. So does this mean that At&t is going to drop their pricing on their 3g to compete with Verizon? I can see this being great for some, but others might prefer 3G built-in rather than carrying another device. Data-price wise, if you are in the 250MB to 1GB range it might be a better deal. But above 1GB and less than 2GB AT&T is better. Above 2 GB Verizon could be better. AT&T would be better if AT&T's iPad data plans worked like the iPhone. On the iPhone if you have the $25 2GB plan and go over it, they charge you $10 for another GB (I believe on iPad you would have to buy another 250MB or 2GB--so the least would be $15 for only 250MB). I went from unlimited to that 2GB plan as I have never, since I got my iPhone in 2007, gone over 1GB. Even with casual tethering to my laptop, and now iPad. One of the big plusses for the 3G model is the built in GPS. I have to wonder if one of the features of the next models will be to have sim card slots on most models and you pick your carrier if you want one. The original 8 or 16 GB wifi model would be the base unit like they did with the iPod Touch, and iPhone, and sold for $499. The higher end models would all have GPS and sim slots.